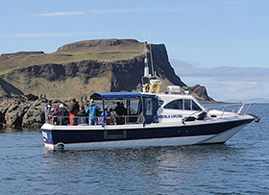 With our faster vessels, the AquaXplore RIB’s and Island Cruiser, we are uniquely placed to offer a range of trips/excursions to the remote islands of Rum, Canna, Soay & the Skye Cuillin, as well as charter trips over a wide area. 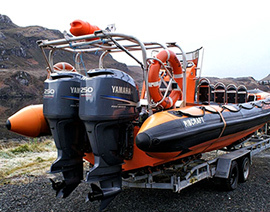 Our 3 AquaXplore RIB’s are high-specification, all-weather vessels designed to meet the exacting requirements of offshore use. They are large RIBs, between 9-10 metres long and wide-bodied so with plenty of space aboard. Each boat has 12 cushioned comfortable individual seats with handrails, the front 3 being double seats for adults with younger children. All seats are mounted to the front of the skippers control console ensuring maximum comfort and a clear field of view for all passengers and crew. Powered by twin Yamaha V6 (250hp and 300hp) outboard engines capable of speeds in excess of 35 knots (40mph), with a typical cruising speed of c.25 knots. Cutting-edge 4 stroke technology ensures fuel efficiency and very quiet operation. Each boat is safety-certified each year under the Maritime and Coastguard Agency's Code Of Practice (Category 4) for 12 passengers + 2 crew. This includes all the latest electronics and safety equipment including 14 person liferaft. 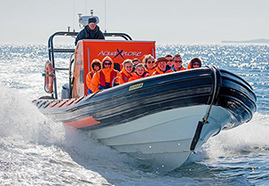 A fast conventional planing vessel designed for the same range of trips as AquaXplore , but with more facilities aboard, including heated wheelhouse, weather canopy, onboard toilet, and wheelchair access. Easy-access side doors open onto the spacious deck area with bench seating and ample space to move around the vessel during the voyage. The space aboard makes the boat ideal for a variety of roles and as a charter vessel for both private and commercial purposes, including filming. The boat is MCA Certified (category 2) to carry 12 passengers and 2 crew and with all the latest electronics and safety equipment, liferaft etc.